Last week, Twin Prime came out of stealth announcing their new mobile app acceleration service and Series A funding of $9.5M. While some might be quick to classify Twin Prime as a CDN provider, they actually preserve existing investments in CDNs and other content engineering based solutions. Twin Prime picks up where other CDNs leave off by focusing on acceleration content across the last mile, for all kinds of mobile content including images, videos, text, and HTTPS over both Wi-Fi and cellular networks. Twin Prime does not host, cache or distribute content. They also do not modify content or resize images or videos. As such, CDNs continue to be the place to distribute content and any other content engineering technology appears complementary to Twin Prime. When the bits and bytes for a particular piece of content is available, Twin Prime finds the most efficient way to request and deliver that data. In mobile almost 70% of end-to-end latency is spent in the wireless last mile, the link between the cell tower and the handset, where the company’s technology is focused. The following diagram illustrates how Twin Prime solution gets deployed with existing solutions like CDNs in tow. Twin Prime’s technology solves the infinite variations in wireless networks by utilizing something they call an Automated Hypothesis Testing (AHT) framework, to achieve real-time selection and deployment of optimization strategies for each mobile session. Each optimization is customized to the specific wireless network characteristics and operating conditions including device, application architecture, network type, quality and location. The biggest insight I gained from them is the need for contextual optimizations, understanding how and where the mobile app is being used, and selecting and executing the right optimizations for that context. However, this is easier said than done. Mobile’s diversity throws up infinite contexts for which performance strategies have to be discovered and selected, which Twin Prime solves by using their AHT infrastructure. Some might think this what traditional CDNs already offer, but most modern CDN performance solutions have been focused on the first mile latency challenges and helping organizations with content distribution, staging and scaling challenges. These technologies were shaped by the consistent nature of wireline Internet. These are solutions are static in nature and can be widely used without needing to how and where the app is being used. While these optimizations worked well for desktop, they fall short in the mobile world because of dynamic mobile operating conditions. CDN solutions continue to be valuable to enterprises today but do not solve the mobile performance problem. Industry data shows that consumers spend more than three hours a day on their mobile devices, 90% of it on apps, and the apps are 3X slower than websites experienced on PC/desktops. Yet almost all these apps already use a CDN today, but the mobile slowness persists. This surely means that the root of the mobile performance problem lies elsewhere, which most current solutions don’t address. What’s unique about mobile is its last mile with its ubiquitous volatility and diversity. The physics of the wireless link implies volatile and continually changing operating conditions including latency, bandwidth, losses, etc. Today there is enormous diversity in how we access data over mobile with 20,000+ device types, 1200+ different operators offering at least 25 different access technologies for 3G, LTE, Wi-Fi etc. The fact that we are mobile means that there are millions more factors tied to location and environment that come into play. The end result, in mobile almost 70% of the end-to-end latency is spent in the cellular last mile. That means, any solution to mobile performance has to start with a focus on last mile, which is where Twin Prime excels. From spending some time with the Twin Prime team it’s clear they have a deep understanding of the constraints of the last mile, and the diversity in devices, carriers, locations in which mobile apps operate. They have built a mobile app acceleration solution that works for all kinds of mobile content and are laser focused on targeting a specific performance problem in the mobile market. Twin Prime says app developers and content owners can use their SDK to optimize their apps in a matter of minutes and already has paying customers. The company provider me with customer names already using their solution, but couldn’t disclose their names publicly as of yet. 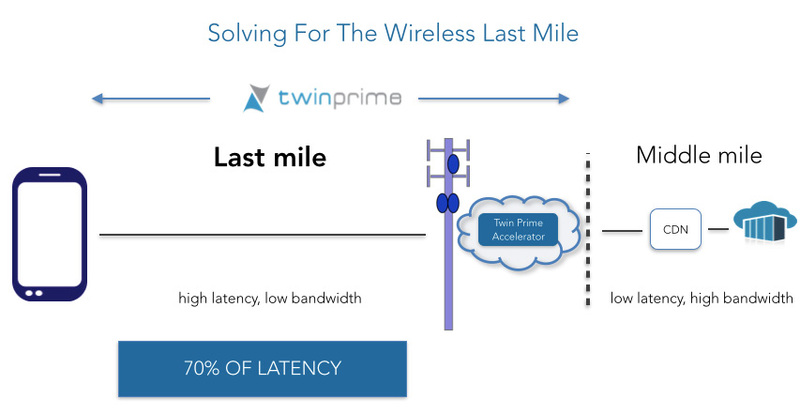 Twin Prime is the kind of company I like keeping an eye on as they appear to have interesting technology, aren’t trying to replace or displace CDNs and are looking to solve a specific performance problem. Such focussed optimization solutions tend to get quick traction and awareness since content owners can see the immediate value proposition they provide. If you want to learn more about Twin Prime’s technology, they will be doing a presentation entitled “Optimizing And Customizing Content Delivery To Mobile Devices“, at the Content Delivery Summit in NYC on May 11th.